Explicit stereotypes or attitudes are opinions that people consciously think about and assess. These can be shared verbally. Implicit stereotypes  are automatic and involuntary associations that people make between a social group (i.e. “men”) and a domain or attribute (i.e. “science” or “math” ). A person can have different implicit and explicit stereotypes. For example, one can have conscious beliefs that men and women are equally capable engineers, yet may automatically associate engineering more with men than women. The implicit association of men with math or science is different than sexism, or explicit stereotypes about women’s abilities, as implicit associations are unconscious and automatic. Women are underrepresented among working engineers . In this study, we explored how the experience of working as an engineer di ers for men and women. We studied professional engineers (263 in total: 145 women, 118 men) who work in engineering companies across North America. All participants were trained and employed as engineers. Working female engineers feel less committed to their job and less valued by their organization compared to their male counterparts. 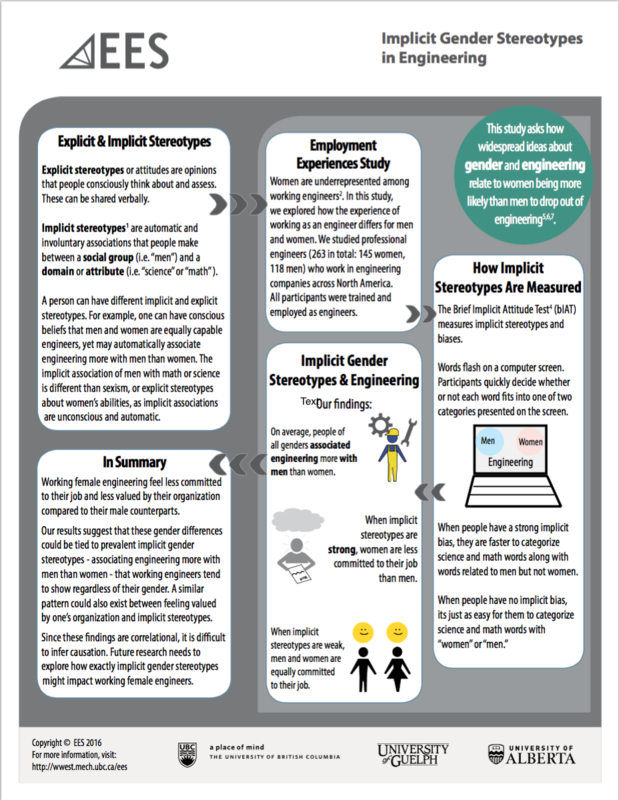 Our results suggest that these gender differences could be tied to prevalent implicit gender stereotypes – associating engineering more with men than women – that working engineers tend to show regardless of their gender. A similar pattern could also exist between feeling valued by one’s organization and implicit stereotypes. Since these findings are correlational, it is difficult to infer causation. Future research needs to explore how exactly implicit gender stereotypes might impact working female engineers. 1. Greenwald, A. G., & Banaji, M. R. (1995). Implicit social cognition: Attitudes, self-esteem, and stereotypes. Psychological Review, 102, 4–27. 2. Hunt, J. (2010). Why do women leave science and engineering? (NBER Working paper 15853). Cambridge, MA: National Bureau of Economic Research. 3. Nosek, B. A., Banaji, M. R., & Greenwald, A. G. (2002). Math = Male, Me = Female, therefore Math ^= Me. Journal of Personality and Social Psychology, 83(1), 44-59. 4. Sriram, N. & Greenwald, A.G. (2009). The brief implicit association test. Eperimental Psychology, 56(4), 283-294. 5. Hill, C., Corbett, C., & St. Rose, A. (2013). Why so few? : Women in science, technology, engineering and mathematics. Washington, DC: AAUW. 6. Brainard, S.G., & Carlin, L. (1998). A six-year longitudinal study of undergraduate women in engineering and science. Journal of Engineering Education, 87(4), 369-375. 7. Beasley, M.A., & Fisher, M.J. (2012). Why they leave: The impact of stereotype threat on the attrition of women and minorities from science, math and engineering majors. Social Psychology of Education, 15(4), 427-448. This material may be distributed for free, but must include EES’s branding.